Now that you know a little bit about the bride and groom, sharing the gift I made/gathered for them will make sense. But before I go any further, I want to give J &V a big thank you for their graciousness in letting me gush on about them. My family and local friends hear my exuberant talk of them often enough... it's fun to share with you, too! 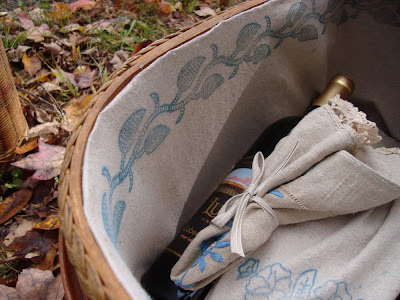 Since the newly weds live near a big park and often travel to the countryside for the weekend, a picnic basket came to mind when planning their present. I looked for the ones like my mother has at the barn, and finally found one that was just right at a nearby antique store. 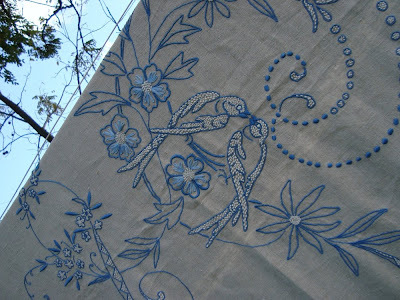 I hoped for a vintage quilt or bed spread for a table cloth/ground cover. There was only one in this little shop, but when I saw that it was in oatmeal colored linen and embroidered with blue flowers, I didn't hesitate. It was spread over a bed on display with other assorted textiles piled on top. I could tell it was in incredible condition, but because I had the kids in tow, I snapped it up before I fully examined it. When we got home, I ran out to the clothesline to shoot it before the sun went away. I photograph almost everything. Look at that crocheted trim framing it! I hadn't even washed and ironed it yet, thus the creases. My son will tell you that I started yelling... I was jumping around in the cold, wet grass doing my happy dance... and yes, yelling and yipping. This beautiful spread, that I planned on folding up in the wedding basket, had two love birds (possibly barn swallows) kissing in the center. Eeep! I knew at once that it was part of a trousseau. A real trousseau! Since I believe in magic and romance, this pretty much took my breath away. The other piece of linen had a little hole in the center. I cut it in half. Wince. and created two picnic napkins. Into the basket went the linens, local wine, and Gimme! coffee. I'd never seen anything like the wicker covered stainless steel thermos, so I had to get that, too! The interior of the basket was sturdy and loved, but needed a little freshening. 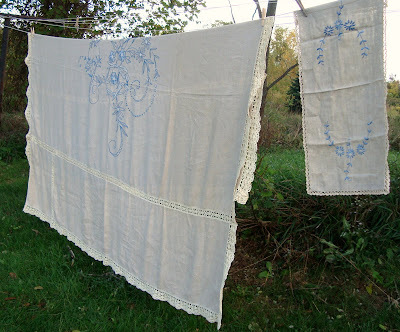 I cleaned it with organic orange oil wood cleaner and lined it with a hand printed cloth to mimic the vintage linens. Something old, something new, something borrowed, something blue. I've bought wedding presents from registries... but this gift seemed to be in keeping with our friends and the spirit of their wedding. Could almost imagine this basket traveling on a steam engine long ago... congratulations and happy picnicking to our favorite love birds. All I can say is wow! Absolutely gorgeous! I love knowing that you are out there creating and sharing beauty in this world! this is/was ment to be! Perfect! What a perfect gift! Sounds suitably serendipitous. Well done! Oh my word, I'm going to re-read the post again and again as I'm loving it all ! What a memorable gift you have made for your newlywed friends ! It really is out of this world !! Two kissing birds ! A basket ! Vintage ! Handprint goodness ! Eeeep, it couldn't be any better ! You are a marvelous friend, Maya. What a wonderful gift and truly lucky people to have you as a friend! I'm getting married in March and hope that someone puts as much thought and effort into a gift that so suits the people that we are. What a great gift! and done with so much love!!!! that is such a lovely, heart-felt gift. Gorgeous job, maya! that is by far the most beautiful wedding gift i have ever seen. so thoughtful and perfect. truly an heirloom. I think it's most definitely the best wedding gift I've ever seen! You're all so kind, but the recipients inspired and are worthy of only the best... so that was my hope. Soooo Perfect! It certainly seems as if these two are destined to last. Warm wishes to them. That is the perfect gift, so much love and thought went into it. How perfect that there are lovebirds on the linens, I bet they loved the gift, and the thermos is great too. Maya, this gift is so perfect!! Wow--it's like all the gift stars aligned. It's perfect, right down to the lovebirds. And I really like the way you worked around the hole and made something useful that coordinated with the theme of the gift. And to me, the handmade basket liner is the best part. What a thoughtful, meaningful gift. Every newlywed couple should be so lucky! Any gift that has this much thought and love put in it is bound to be perfect. That picnik basket is so neat! And the linens...oh I love old linens! Can anyone wonder why I love Maya? Everything she does is thoughtful and beautiful. This basket will be a family heirloom for us and a constant reminder of a treasured friendship. This is SO beautiful!!! I like that you were able to print part of the ensemble as well. 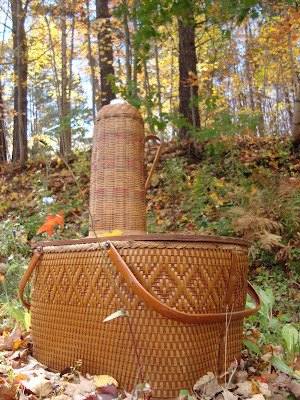 How did you attach the lining to the basket? This gift is beyond wonderful! Wow! Serendipity with a dash of Maya = perfection. thanks for your props, but it was truly meant to be. Vikki, I had hoped to staple gun the lining in and trim it with ribbon, but nearly broke my wrist with the weird angle. In the end, I took measurements and sewed the lining to have similar dimensions to the interior. Printed it. Heat set it. Folded under one side and hot-glued it to the rim. You could remove it if need be, but it's fairly permanent if not. I thought about drawstrings, but it got messy looking and I wanted tidy. Maya that gift is incredible. I often dream of making something like this for all the soon to married couples I know, but I always run out of time (probably because I'm busy having babies). Oh and the wedding itself...fabulous! Hi Maya, what a beautiful gift! That picnic basket looks alot like mine, and if I am correct, it would have Redmon, Peru Indiana stamped inside it. I love the serendipity in finding the blanket with the birds, when gifts come together like that, it just makes giving the even more fun. Have a wonderful day! such a thoughtful gift maya!! What a gift of love you gave this special couple. I LOVE the spread! It is worth a royal happy dance. The basket is gorgeous, as is how you lined it. Just beautiful. And the thermos is fabulous. The napkins, wine, coffee...well, it is all just perfect. Isn't is cool being a part of things like this-when a "meant to be" is in the works? They don't come around that often and when they do they are so incredible. Lucky you! The picture of you - in my head - of the happy dance this find produced is so FUN. Your joy, and the way you share it, give me such JOY. It's not only unique and beautiful, it's such a loving gift of the heart for who they are as people and a couple. The love birds are wonderful! What a beautiful and thoughtful gift! Really, really wonderful in every way. All I can do is sigh with pleasure! The last couple of posts have been so romantic and beautiful. Thanks for "inviting" us to the fun too. Wow, wow!!!!!! So very lovely and thoughtful and wonderful!!!!!!!! You packed so much love and care into that basket, and I'm sure at some level you saw those lovebird/swallows on the blanket. It gives me the shivers how perfect it all is!! Oh wow. What a wonderful gift. Just the parts would have been so lovely, but the whole is just breathtaking. Yah! you right this a wonderful and so impressive gift,its good that you shared you this.